Print is all around us in many forms. Media literacy and environmental literacy make up another layer of literacy! Use this as a take-home family project or for an individual homework activity. This download includes 2 different take-home printables, or two versions. You can hand out one at the beginning of the year, and the second one later on, or let the kids choose which one to take home. Kids take this home to do with their families or siblings. It’s a great opportunity for your youngsters to see that environmental print and media text (no matter how big or small) is all around us! 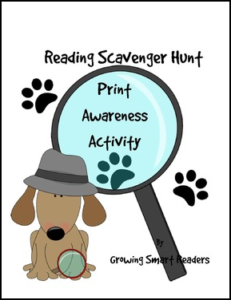 I use reading scavenger hunts as one of my annual literacy week activities. Each reading hunt is a simple checklist, but it has a multi-purpose: to teach print awareness, encourage family reading, and open up new opportunities for reading and writing in and outside the home. Emergent and beginning readers would share this activity with a sibling, a parent, or grandparent, or caregiver. Perfect for after school programs, too! It’s also a natural way to bring print awareness to your students who are learning English as a second language. You set the deadline date in the space, and the number of how many items they need to find, read, and check off. They check off items that they have found and read. They must bring in a little proof (i.e., a coupon, a note, or a label) as part of the assignment. Parents, or guardians and students must sign at the bottom to verify the scavenger hunt was completed. Yes, it is pretty much an honor system, but everyone has fun doing it. I usually hand out little prizes for completing this (pencils, bookmarks, fun erasers, or Smarties candies…). You really can make this as fun as you want! Please enjoy and leave feedback if you found this to be a helpful resource. Thanks very much!